The internet payment service Paypal faces heavy criticism after a recent story in which a seller claims Paypal "forced" a buyer who disputed the authenticity of a violin to destroy it in order to get their money back. According to the Guardian a seller named "Erica" sold an old French violin to a buyer in Canada for $2500, and had the violin authenticated by a "top luthier" prior to sale. Obviously we don't' know who the luthier was, and it goes without saying that violin makers often disagree on the authenticity of labels and instruments, but irregardless, the buyer disputed the authenticity of the instrument upon receiving it. Rather than simply get in touch with the seller and arrange to return the instrument, the buyer contacted Paypal directly to try and get their money back. Paypal responded that in the case of "counterfeit" merchandise (a category that a disputed violin absolutely does not belong in) the buyer must provide evidence of having destroyed the merchandise in order to get their money back. The buyer proceeded to smash the violin and send pictures of the wreckage to the seller. Paypal gave the buyer their money back, and the seller was out both the money and the violin. A close examination of Paypal's regulations confirms that they may require a buyer to destroy an item claimed to be "counterfeit." In the case of something as precious as an old violin, the sheer senselessness of this policy boggles the mind. There is absolutely no reason that this violin should have been destroyed, and now this instrument is lost forever. This was not a "counterfeit" violin, but rather a violin with a disputed interior label. This sort of situation is hardly exceptional. Violin makers often disagree over instrument authenticity. 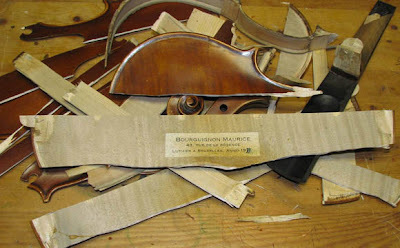 Appraising a violin is a complicated and delicate process that involves examining pieces of wood that are often hundreds of years old, and sorting out original work from repair work, and false labels from authentic labels. It is unconscionable that Paypal would have a violin destroyed in order to resolve an internet business transaction. They have neither the expertise nor the ability to reliably resolve a dispute over a violin, and ordering the violin destroyed benefits no one. If the seller was unhappy with the violin they should have simply returned it. Hopefully the exposure garnered by this incident will result in a change of policy for Paypal, and ensure that this situation is never repeated. Old violins are a precious commodity, and the last thing we want to see is someone taking a hammer to one in order to get a refund. Here is The Guardian's article in its entirety. No matter the intrinsic qualities (or defects) of a violin, in a so miserable world - where there are a lot of talented (but poor) young musicians who would be happy if could buy a Chinese one -, to destroy (or to approve the destruction of) an instrument means not only complete lack of sensitiveness, yet an infamous crime against society. Besides – as wisely says Ivry Gitlis – in name of Art, no one owns a secular instrument: we just go through its life and must conserve it to other generations. Lastly, who destroys a musical instrument never can be considered a musician, even less an artist.